The naked lady tee won’t hold a ball anymore. But her legs make a great greens repairer. I will let the photo do the talking on this one. 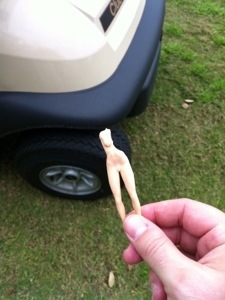 Not only had I never seen one in real life, but I didn’t realize naked lady tees are actually shaped like naked ladies. You find lots of broken tees as you get to a par 3, but I got a real kick out of this gem. Even though it’s only half a naked lady torso, I can only picture a modern day Al Czervik in the pro shop setting up Wang with all he’ll need.